In a world where magic, myth, and fantasy are interwoven, a creeping wave of corruption is transforming the landscape and scarring the balance of life. 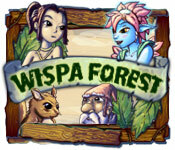 Help guide a young Wispa, Lyia, on her quest to discover the source of the corruption by removing otherworldly debris, collecting trinkets, and protecting the native flora and fauna in Wispa Forest! Explore a gorgeous hand drawn world in this exciting Hidden Object game! Help Lyia save her world!